Apple is planning on releasing three new iPhone models in the second half of 2015, according to a new report from DigiTimes. 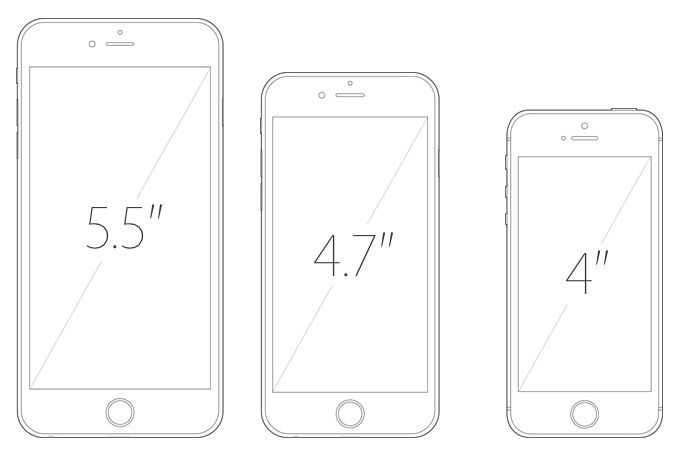 The site claims that a 4-inch iPhone model will join the 4.7-inch iPhone 6s and 5.5-inch iPhone 6s Plus. Apple will release three different iPhones in the second half of 2015, the iPhone 6S, iPhone 6S Plus and a 4-inch device currently being referred to as iPhone 6C, according to industry sources. A new 4-inch iPhone was also rumored in December 2014, with a report claiming that the device would be aimed toward female users. However, even if a new 4-inch iPhone isn't introduced, Apple will presumably have the iPhone 5s to offer for free on a two-year contract once the current models slide down. DigiTimes notes the 4-inch iPhone 6c is likely to be manufactured by Wistron while both the 6s and 6s Plus will be manufactured by Foxconn. In January, a report from Chinese site Feng.com claimed that Apple had not made any orders in its supply chain for a 4-inch iPhone. Earlier this year, CEO Tim Cook said the new, larger iPhone models had brought the highest Android switcher rate over the past three years and that they brought in more newer customers than previous iPhone models. It's possible that Apple believes offering more sizing choices to customers could allow Apple to reach more customers, as Cook also mentioned different regions preferred different sizes. Apple is expected to announce new iPhone models in September, with new additions to both the iPhone 6s and 6s Plus rumored to include 2GB of RAM and Apple's new Force Touch technology, which has already made its way into Apple Watch, the new MacBook and new 13-inch MacBook Pros. I just pray they keep good specs in the 4 inch display! I have large hands, I can palm a basketball easily, and I think the iPhone 6 display is simply to big. When Steve Jobs said the 4 inch display was the perfect size because your thumb could easily manage the corner of the device, he couldn't have been more correct. Another vote for a smaller flagship. The 6 and 6+ are clown phones. New iPhones this year? That's so unlike Apple! If they could make 32Gb the entry level on all sizes. Every other feature is just a bonus. Jobs said the 3.5 inch display was the ideal one. The 4 inch came after he died. I have a 6 and like it, but when I use my gf's iphone 5, I'm reminded that 4" really is the sweet spot. I'd go back in a heartbeat, if it was otherwise comparable to the bigger models. Back to a tiny iPhone, I'm not surprised. Jobs alone spent a very long time programming the faithful that it's all they'd ever need. A massive group of the Apple faithful bought that story hook, line and sinker. Or maybe some of us just prefer smaller phones over phablet sized ones. The 4-inch models are not "tiny". It's a very practical size. Okay, we'll see who goes back to the iPhone mini. I'll be really disappointed if this "6C" is a low-cost model. I've held off upgrading my personal phone because I dislike the 6 and 6+ form factors so much. Please yes on the smaller iPhone!! !